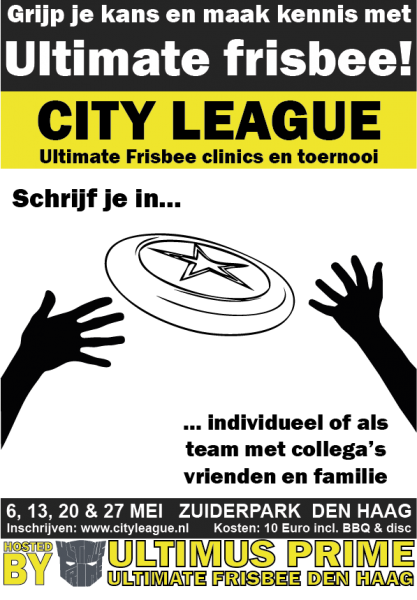 Every Tuesday night in May, we play Ultimate Frisbee in the Zuiderpark in the The Hague City League. On May 6, 13 and 20 there is a tournament for players of all strengths and on May 27 we finish the league with a fun social event. The The Hague City League is an introduction to the sport of Ultimate Frisbee, suitable for beginners and experienced players alike. Ultimate Frisbee is about playing the game well, but equally about playing with spirit. We play hard, but are fair to all. We will start with a short introduction to the sport and practice some throwing. After that the tournament starts. The tournament is played on the first three days, on the fourth day we end the event with a barbecue and some frisbee games. We play in the Zuiderpark in The Hague (near the entrance at the Anna Polakweg), every Tuesday in May: 6th, 13th and 20th, from 19:30h until 21:00h. Note: on the fourth evening (May 27th) we'll have the barbecue and start one hour earlier, at 18:30h. Anyone is welcome, absolute beginner to world class player. You can enroll individually, or get your friends and colleagues to sign up as well to form your own team (up to about seven players per team). Single players will be assigned a team. You pay €10 for the tournament and get an official frisbee game disc and the barbecue on the fourth day. That is real value for money! For any questions, please send an email to cl@ultimusprime.com and we'll try to respond quickly. The Hague City League is organised yearly by Ultimus Prime. Ultimus Prime is the club for Ultimate Frisbee in the The Hague area. Everything is here: indoor pitches, grass and beach - and very nice people! Did you catch the spirit? Join UP! We practice every week and play leagues and tournaments, both indoor and outdoor, on grass and on the beach. We organise tournaments too, like Monsterball and Ladies Lighthouse.